It’s a 7 week countdown now to the Gold Coast Marathon and I have struggled this week to remain motivated. The weather has gotten colder, it’s dark in the mornings and early evening and I just want to stay in bed! I had a couple of sessions where I pushed them to later in the day rather than the morning, and a couple of sessions where I didn’t want to run – I did feel better once I was up and running though but I hate it when it is hard work to get motivated and the mileage is pretty long as the marathon edges near. I’m at about 75-80km this week. 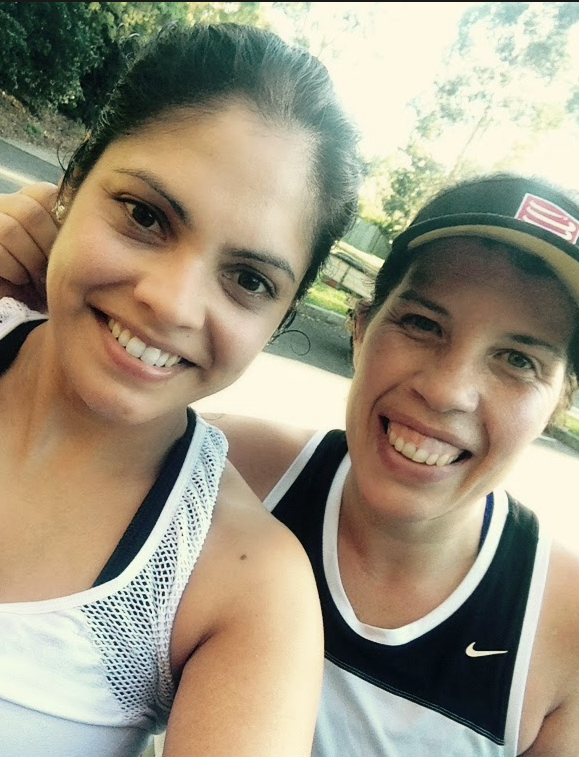 Post training with my lovely friend Karen who has kept me going on the long runs with her company, jokes and encouragement! I think I have said this in a number of posts now but it’s so true. Whenever I have felt demotivated in the last week or so I have just looked at my photos from races and put my eyes back onto the goal – the marathon. It’s been good as The Gold Coast Marathon have sent a few emails out this week so it has forced me to think about the race anyway! I am a person motivated in my running by my music – so when I feel really demotivated I crank upon the tunes. Each month I share some of my running tunes I listen to and I will be putting a list for the marathon together which I will share but I find that certain songs really lift me and push me so music has been a great motivator for me this week. Like I mentioned before I switched some of my training around so I ran later in the day rather than early in the morning and I found it worked me. Stepping outside of the door when it is sunny and warm rather than dark and cold does wonders for the motivation! I haven’t done this but I know a lot of people that when they did their marathons joined a marathon running group or a friendly running group so that they had company to run with. I have my lovely friend Karen who is running the half marathon this year who runs with me on my long runs for part of the way and makes me laugh so much I forget about the distance ,and then the other part once she is finished it’s me, the music and the open road which sometimes gives me time to reflect so not running as a group isn’t an issue for me but it might be something you find you need.